Five people have been charged with animal cruelty over the discovery of scores of neglected horses, ponies and donkeys on a Buckinghamshire farm. RSPCA staff and vets removed 125 animals from Spindle Farm, Hyde Heath in Amersham. The animals were rescued in January in an operation which took eight days. James Gray, 44, Julie Gray, 40, Jodie Gray, 25, Cordelia Gray, 19, and a boy of 15, all from Spindle Farm, are due before Oxford magistrates on 27 March. The accused face a total of 12 charges under the Animal Welfare Act 2006. A spokesman for the RSPCA said the charges related to "causing unnecessary suffering to and failing to meet the welfare needs of a total of 125 horses, ponies and donkeys". The maximum sentence for each of the charges is six months in prison or a £20,000 fine. 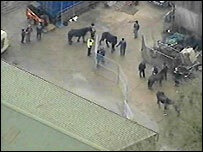 Redwings Sanctuary, in Hapton, Norfolk, took 21 of the horses, ponies and donkeys that were rescued from the farm. James Gray appeared in court last month charged with three offences related to alleged offences at the time of the visit by animal welfare representatives. He denied charges of assault and obstructing a police officer in a case which was adjourned until 9 May.